This dual slide with bounce house combo can be used wet only. It features a bounce house, two climbers, and two slides for double the fun! The Module Slide is perfect for theme-less events or for use with one of our many different themed banners! 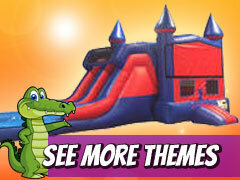 Whether you have a kids' show, birthday, superhero or luau themed event, the Module Slide is sure to match any event theme! (Water system is provided; customer must have a water source with a hose that reaches to the set up area). ENTRANCE TO SETUP AREA MUST BE AT LEAST 3 FEET WIDE.